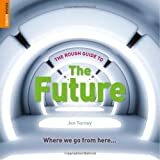 Find the future now with 50 predictions in The Rough Guide to the Future. Wondering what’s really in store for the human race? Is it nanotechnology and gene enhancements, solar power, and carbon capture? Or oil shocks, water wars, food shortages, and mass extinction? The Rough Guide to the Future cuts a clear path through the jungle of scientific research and political debate, steering you around the prophets of doom and the utopian visionaries, to take you on a tour of the likeliest possibilities for the rest of this century — and beyond. It covers 50 predictions from the world’s leading futurologists and chronicles predictions from the past along with visions of the future. You’ll find out where we go from here with The Rough Guide to the Future.